See the family of four standing on the hillside? They are about to embark on an American journey. The little boy points at the scene below. The mother looks back at us, as if to say, "Want to join us?" The family of four looks down from the hillside. They see children playing jump rope and baseball in the yard of a schoolhouse. They see a Model T Ford parked against the trees. They see two cowboys conversing in a field. They see a wagon train on the trail that winds past an Indian village. They see a train traveling along in the distance on the outskirts of a town full of buildings, the tall steeple of a church its most prominent feature. Beyond and above the town, they see smoke billowing from the factory smokestacks of another generation of Americans. The smoke blows away from the densely populated residential community. And on the very top of the most distant hill, they see a metropolis. Flying over the skyscrapers, they see an airplane and a blimp. A beautiful picture of life in America, yes? But that is only half of the picture. Yes. The complete panorama of American Life. From the ships in the harbor, to the Pilgrims and the Indians, to the colonials embarking on a stagecoach, to the farmer plowing the field. And to Ben Franklin flying his kite high up in the American sky. My sky. Arthur Schlesinger's sky. Arthur Schlesinger's History of American Life from beginning to end. NOTE: Because of spammers, all comments are supposed to be sent to my dashboard for my review before I post them. However, comments from people signed in on WordPress are not being forwarded. Please contact me via email if your comments don't appear in two days. It would be interesting to know more about the artist, Paul Laune, and what connection he had with Schlesinger. A quick search in a couple of places indicates he was born in 1899, illustrated a number of books, many with western American themes, some of the Hardy Boys series, and was art editor of the New York Sun. Grew up in Woodward, Oklahoma, where he painted murals for the rotunda of the local museum (Plains Indians & Pioneer Museum: http://www.pipm1.org/index.php?module=exhibits&section=3&catid=3&id=4) and there’s still an annual art competition named for him. 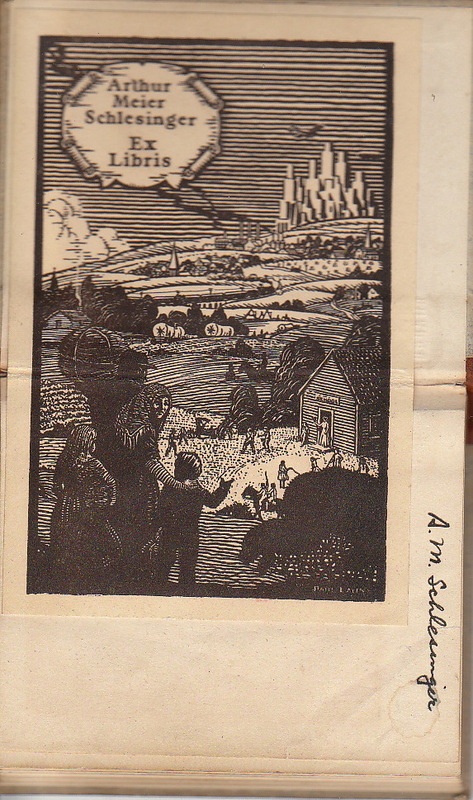 A story by him is on p. 14 of http://digital.library.okstate.edu/oktoday/1960s/1964/oktdv14n4.pdf Clearly right in line with the endpaper illustrations for the Schlesinger series. I also would like to know more about Paul Laune's connection to Arthur Schlesinger. Paul was my husband's godfather; I took some painting lessons from him until his untimely death in the mid 1970's. He was quite a prolific illustrator of children's books but his first love was for horses and Western art. 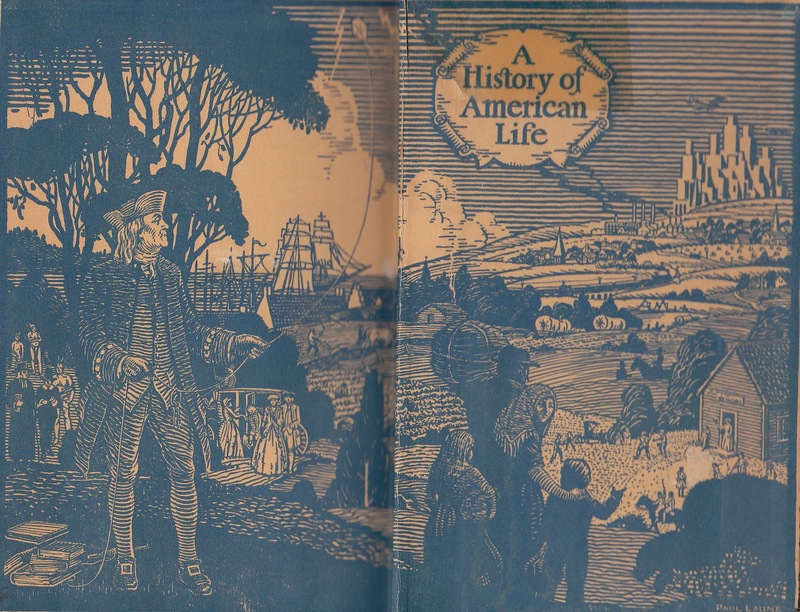 The only connection between Arthur Schlesinger and Paul Laune might be that Schlesinger was the author of the book and Laune was the artist who created the "borders" or illustrated endpapers. Laune illustrated a number of books for The Macmillan Company and for other publishers as well. I see that this is over a year old. It was mentioned in a LibraryThing.com forum about endpapers. I see that Paul Laune illustrated these (though the style reminds me of the work of Robert Lawson). Laune illustrated juvenile series books, including some volumes of the Hardy Boys and Trixie Belden series. I have some info on him should you desire more than this. Please post any info on Paul Laune. JL, Beth, and I want to know more about him. I am trying to track down who has rights to Paul Laune illustrations. We want to use an image of his that I found in a book by song collector Dorothy Scarborough printed in 1937. The image would go in a section on song collectors in a new book my husband is writing.Columbia University, which published the book, renewed the rights in 1968 but not the rights to the illustrations. Any one have any ideas? His wife, Irene Laune, lives in Phoenix, AZ. She is in her 90s. She probably retains publishing rights to his illustrations.